Posted by Amanda Hicks on Friday, October 27th, 2017 at 3:00pm. Not into Halloween? Celebrate chocolate and beer instead! Head to Side Door Brewing Company in Port St. Lucie this Saturday, October 28th, for National Chocolate Day! Featuring seven chocolate beers, a number of other custom drafts, and chocolate snacks from Castronovo Chocolate, you're in for a sweet treat. 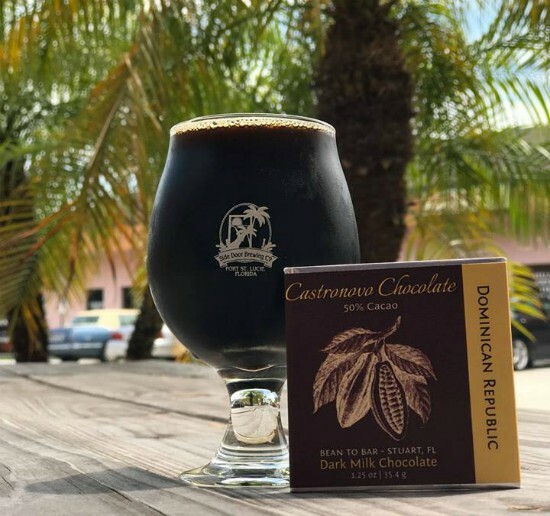 From 1 p.m. - 4 p.m. try out the brewery's chocolate beers and taste authentic bean-to-bar chocolate from Castronovo's in Stuart, who buys their cocoa straight from Latin American estate farms to make delicious truffles, seasonals, and chocolate chip cookies. Their chocolate has won numerous awards including the International Chocolate Award and Chocolate in London Award. From 4 p.m. - 9 p.m., Creative Chef on Wheels, a 5-star local food truck, will be on scene serving up your favorite comfort foods and sandwiches made with only organic fruits and veggies and locally-raised beef. Hang out and play some darts, ring toss, or corn hole in the outside seating area. Come support Side Door Brewery and other local businesses this Saturday and don't miss out on something sweet.